Egmont's Copper Sulphate is also known as Bluestone which will control algae and moss on paths and driveways. Also used to correct copper deficiency in fruit trees and vegetables. 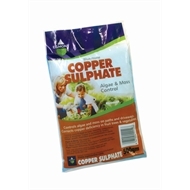 Copper is necessary for healthy foliage, growth, respiration and photosynthesis in plants. For Moss in lawns used Egmont's Sulphate of Iron.